Creedence Clearwater Revival (CCR) was an American roots rock band that gained popularity in the late 1960s and early 70s with a string of successful songs from multiple albums released from 1968-70. The group consisted of singer, lead guitarist, and songwriter John Fogerty; rhythm guitarist Tom Fogerty; bass player Stu Cook; and drummer Doug Clifford. Their musical style encompassed rock and roll and the so-called swamp-rock genre, of which they were a leading example. Hit singles such as "Suzie Q," "Bad Moon Rising," "Up Around the Bend," and "Proud Mary" established CCR as one of the top rock groups of the late 1960s. The band broke up in 1972. 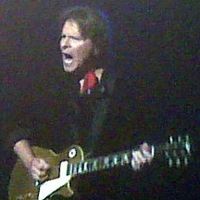 Lead singer John Fogerty retreated from music in the late 1980s but returned in 1997, with the Grammy-winning album Blue Moon Swamp. Creedence Clearwater Rival was inducted into the Rock and Roll Hall of Fame in 1993. CCR's music is still a staple of American and worldwide radio airplay, and is often hear in movie soundtracks and other media. John Fogerty, Doug Clifford, and Stu Cook (all born 1945) met in high school in El Cerrito, California and began playing instrumentals together under the name The Blue Velvets. The trio also backed singer Tom Fogerty—John's older brother by three years—at live performances and in the recording studio. By 1964, the band had signed to Fantasy Records, an independent jazz label then based in San Francisco. However, the group suffered a setback in 1966, when the draft board called up John Fogerty and Doug Clifford for military service. Fogerty managed to enlist in the Army Reserve instead of the regular Army, while Clifford did a tenure in the United States Coast Guard Reserve. In preparation for the band's first release, Fantasy co-owner Max Weiss renamed the group The Golliwogs (after the children's literary character, Golliwogg), apparently to capitalize on a wave of popular British bands with similar names. During this period Stu Cook switched from piano to bass guitar, Tom Fogerty became the band's rhythm guitarist, and John Fogerty began to sing lead and write much of the band's material. In 1967, Saul Zaentz purchased Fantasy Records from Weiss and offered the band a chance to record a full-length album, but only if the group changed its name. Never having liked The Golliwogs, the foursome readily agreed. Zaentz and the band agreed to come up with ten suggestions each, but he enthusiastically agreed to their first: Creedence Clearwater Revival. The band took the three elements from Creedence Nuball, a friend of Tom Fogerty; "clear water," from a TV commercial for Olympia beer; and revival, which spoke to the four members' renewed commitment to their band. By 1968, Fogerty and Clifford had been discharged from military service. All four members subsequently quit their jobs and began a heavy schedule of rehearsing and playing area clubs full-time. The group's 1968 debut album, Creedence Clearwater Revival, struck a responsive note with the emerging underground pop-culture press, which touted CCR as a band worthy of attention. More importantly, AM radio programmers around the United States took note when a song from the LP, "Suzie Q," received substantial airplay in the San Francisco Bay Area as well as on Chicago's WLS. "Suzie Q," which was a remake of a 1956 hit for rockabilly singer Dale Hawkins, went on to be the band's first single to crack the Top 40. It just missed the Top Ten at number 11 and was Creedence's only Top-40 hit not written by John Fogerty. Other singles from the album included a cover of Screamin' Jay Hawkins' "I Put a Spell On You" and "Porterville," written during John Fogerty's Army Reserve stint. After some eight years of making music together, the group became an "overnight success." While undertaking a steady schedule of live dates around the country to capitalize on their breakthrough, CCR also worked on their second album, Bayou Country, at RCA Studios in Los Angeles. Released in January 1969 and becoming a number seven platinum hit, the record was the first in a string of hit albums and singles which continued for the next three years. Bayou Country's seven songs were well-honed from Creedence's constant live playing. The album showed a distinct evolution in approach, much more simple and direct than the band's first release. The single "Proud Mary," backed with "Born On the Bayou," went to number two on the national Billboard chart. It would eventually become the group's most-covered song, with some 100 cover versions by other artists to date, including a hit version in 1971, by Ike and Tina Turner. Only weeks later, in March 1969, "Bad Moon Rising," backed by "Lodi," was released and peaked at number two on the charts and has proved to have strong staying power over the years as it has been incorporated in numerous movie soundtracks. The bar-band story of being "stuck in Lodi again" became a popular staple on then-emerging FM radio. The band's third album, Green River, followed in August and quickly went gold along with the single "Green River," which again reached number two on the Billboard charts. The B-side of "Green River," "Commotion"—a one-chord, two-step about the perils of city life—peaked at number 30. Creedence continued to tour heavily, including performances at the Atlanta Pop Festival and Woodstock. A fourth album, Willy and the Poor Boys, was released in November 1969. "Down on the Corner," a good-time, street-corner number, and the militant "Fortunate Son" climbed to number three and number 14, respectively, by year's end. The album featured Fogerty originals and two reworked Lead Belly covers, "Cotton Fields" and "Midnight Special." The success of Willy was the final touch on a remarkable year for the band: No less than four hit singles and three full-length, top-selling albums. Few, if any, artists of the era could match CCR for stamina, creative output, and commercial success. The band's sales may have been even greater during this period if their double-sided singles had been released separately. Early in 1970, CCR released yet another new double-sided single, "Travelin' Band"/"Who'll Stop the Rain." "Travelin' Band" bore enough similarities to Little Richard's "Good Golly, Miss Molly" to warrant a lawsuit that was eventually settled out of court. In the meantime, the single had topped out at number two. The band also recorded its January 31, 1970, live performance at the Coliseum in Oakland, California, which would later become a television special and live album. By February, Creedence was featured on the cover of Rolling Stone magazine. In April 1970, Creedence was set to begin its first European tour. To support the upcoming live dates, Fogerty came up with "Up Around the Bend," a good-time party rocker, and the broody "Run Through the Jungle," about the burgeoning problem of societal violence in the United States. The single—written, recorded, and shipped in only a few days' time—went to number four that spring, ensuring enthusiastic response from European live audiences and high commercial success in the U.S. and the rest of the world. The band returned to San Francisco in June to record what many consider its finest album, Cosmo's Factory. The album contained the earlier Top Ten hits "Travelin' Band" and "Up Around the Bend" plus highly popular album tracks such as the opener "Ramble Tamble," an ambitious and snarling seven-minute cut about life in America with its "police on the corner, garbage on the sidewalk, actors in the White House." Cosmo's was released in July 1970, along with yet another number two hit, "Lookin' Out My Back Door"/"Long As I Can See the Light." The album showed that John Fogerty's musical range clearly had expanded. He now wove in slide guitar, keyboards, saxophones, tape effects, and layered vocal harmonies—pushing himself vocally more than ever on "Long As I Can See the Light." The album, 11 songs in all, was Creedence's best seller and went straight to number one on the Billboard Top 200 Album chart and number 11 on Billboard's Soul Albums chart. Although CCR never reached the top of the Billboard singles chart, radio station WLS, rated three of their singles at number one—"Bad Moon Rising" on June 9, 1969, "Up Around The Bend" on May 25, 1970, and "Lookin' Out My Back Door" on September 14-21, 1970. The band also had number one singles in many countries and had released four Top-Ten albums in 18 months. The Cosmo's Factory sessions had seen the stirrings of tensions within the foursome as the incessant touring and heavy recording schedules took their toll. One issue was that John Fogerty had taken control of the group in its business matters and its artistic output, a situation that began to grate on Tom, Stu, and Doug, who wanted more of a say in the band's workings. Other issues included John's decision at a Nebraska gig that the band would no longer give encores at its live shows. Pendulum, released in December 1970, was a top seller, spawning a Top Ten hit with "Have You Ever Seen the Rain?." The album marked yet another shift in the band's approach. Gone was the wall of sound of Creedence's previous three albums, and production was dry and tight. However, continued musical innovation and success could not resolve the band's internal differences. During the recording of Pendulum Tom, who had already temporarily quit the band several times in disgust but was always talked into returning, determined to leave Creedence Clearwater Revival permanently. The band's final album, Mardi Gras, was released in April 1972, including the 1971 hit single, "Sweet Hitch-Hiker"/"Door to Door." It received mostly poor reviews and suffered comparatively weak sales, the worst showing of any Creedence single and album since 1968, peaking at number 12. Despite the poor reception of Mardi Gras and deteriorated inter-group relationships, the band immediately embarked upon a two-month, 20-date U.S. tour. But less than six months later, on October 16, 1972, Fantasy Records and the band officially announced the disbanding of Creedence Clearwater Revival. In 1973, John began his solo career with The Blue Ridge Rangers, his one-man band collection of country and gospel songs. After a dispute with his former label and a period of retirement from the music business, he had a major hit with Centerfield, a chart-topping success in 1985. In February 1987, Fogerty finally broke his self-imposed 1972 ban on performing his CCR hits, to the delight of his fans. He retreated from music again in the late 1980s, but returned in 1997 with the Grammy-winning Blue Moon Swamp. John Fogerty still tours frequently and plays popular CCR tunes alongside material from his newer albums. Tom Fogerty released several solo albums, though none reached the success of CCR. His 1974 solo album, Zephyr National was the last to feature the four original band members. In September 1990, he died of AIDS, which he contracted via blood transfusion during back surgery. John and Tom never resolved the bitter estrangement that followed their falling out in CCR. Junior high buddies Doug Clifford and Stu Cook continued to work together following the demise of CCR both as session players and members of the Don Harrison Band. They also founded Factory Productions, a mobile recording service in the Bay Area. Following a relatively lengthy period of musical inactivity, the two formed Creedence Clearwater Revisited in 1995 with several well-known musicians. Revisited toured globally, performing the original band's classics. A 1997 legal injunction by John Fogerty forced the group to change its name to Cosmo's Factory, but the courts later ruled in Cook's and Clifford's favor. a compilation album of The Golliwogs' early recordings. Fantasy also released the highly successful Chronicle, Vol. 1, a collection of Creedence's 20 hit singles, in 1976. Several years later, the label released a live recording entitled The Royal Albert Hall Concert. Unfortunately, the 1970 performance was recorded at Oakland, California, not at the Royal Albert Hall in London, England, as stated on the sleeve. Subsequent issues of the original 1981 album have been retitled simply The Concert. In 2004, Fantasy was sold to Concord Records. As a goodwill gesture, Concord honored the unfulfilled contractual promises Fantasy made nearly 40 years ago, finally paying the band a higher royalty rate on their sales. John Fogerty also signed a new contract with Concord/Fantasy. In 2005, the label released The Long Road Home, a collection of Creedence and Fogerty solo classics. His latest album, Revival, came out on the Fantasy label in October, 2007. Even in the immediate years after breaking up, CCR's stature as one of the great American rock bands was secure. Their music went on to influence entire genres such as heartland rock, country rock, alt-country; and even punk and heavy metal. Musicians revere the band for its unpretentious passion. Decades later, CCR's music remains in heavy rotation on oldies and classic- rock radio stations. 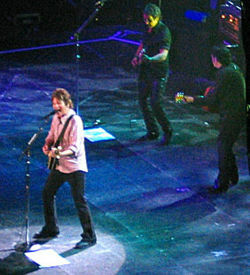 Fogerty's songs, considered classics of the rock form, have been covered by multiple artists. Unlike most other rock artists of the day, Creedence Clearwater Revival eschewed drug use and did not contribute significantly to left-wing activism—although they were all against the war in Vietnam, and they contributed substantial money to the American Indian Movement. However, "Fortunate Son" in particular has become an anthem against war, class privilege, and jingoism. Creedence' songs frequently appear in films and on television, and indeed the band continues to attract young fans born long after the band split up. Although the band never reached the number one slot on the Top 40, songs like "Bad Moon Rising" and "Proud Mary" have lived on long after many "number ones" have been forgotten. Creedence Clearwater Revival was inducted into the Rock and Roll Hall of Fame in 1993 on the first ballot. Bordowitz, Hank. Bad Moon Rising: The Unauthorized History of Creedence Clearwater Revival. New York: Schirmer Books, 1998. ISBN 978-0028648705. Tanner, Mike. Flat-out Rock: Ten Great Bands of the '60s. Toronto: Annick Press, 2006. ISBN 978-1554510368. Werner, Craig Hansen, and Marsh, David. Up Around the Bend: The Oral History of Creedence Clearwater Revival. New York: Spike, 1998. ISBN 978-0380801534. History of "Creedence Clearwater Revival"
This page was last modified on 8 December 2017, at 16:14.